A good friend of ours recently discovered this hot sauce while in St. Lucia on his honeymoon. He begged us to carry this wonderful blend of Scotch Bonnet Peppers, mustard and other treats. You will not find a table in St. Lucia without a bottle on it...find out why! It's been a while since having Barons Hot Sauce took me right back to St. Lucia, glad I found MoHotta!!! Love this sauce! Brings back memories of time spent in the carribean. Only place I can find it is online. Forst had it at a place in St.Thomas that stuck their own label on it. Luckily the waitress told us what it really was lol! Very good flavor! And perfect on the amount of heat. Great balance! Found this sauce while vacationing in St. Lucia years ago. It is now my favorite. Glad i found it here! This is a great sauce....flavor, taste, nice heat... one of my favorites!!! I discovered Baron's on a Caribbean dive trip. Buy it whenever Mo Hotta Mo Betta has it. first tried it in April 2016 while in St. Lucia. Love it on everything... gives stir fry that extra kick too!!! Best Seafood hot sauce in the world, bar none!!! 2nd greatest hot sauce if all time. My favorite Habanero based hot sauce ever was Inner Beauty. They haven't made that in years. This is complex in flavor highlighting the tropical fruit flavors of the Habanero, deep and complex flavor profile, and slow building burn. This is a good substitute for Inner Beauty. I gave it to a relative and he says he really enjoy the taste and it was not too hot. Good tasty sauce. Nice heat, not overwhelming. I felt like I was back in St Lucia....thanks! Great sauce! Spices up my soups and vegetables with a delightful flavor! Had this product in St Lucia. It is a favorite with the locals. You only need a couple of drops, so the bottle lasts a longtime. Excellent. I highly recommend trying it. This is great West Indian hot sauce. A piquant sauce, pleasantly pungent or tart in taste with a habanero/mustard powder combination that kicks. A little goes a long way! Excellent selection of wonderful products and outstanding service. Thank you. The ultimate heat condiment for dogs and sausage....if you would use mustard, use this instead. Have been a big fan of this sauce since tasting it in St. Lucia. Could only find it throug Mo Hotta Mo Betta and have turned so many more on to it since finding the definitive source of great products of this nature. This is the ONLY hot sauce to use on eggs whether they're scrambled, omelet or even quiche. Got my whole family hooked on it. Try it, you'll love it! Had a friend bring me two bottles of this nectar from an island vacation...one of the tastiest sauces I've ever had.Both bottles gone....glad to see I can find it here. We too had this first in St. Lucia. Found it at Mo Hotta Mo Betta and bought all they had some time ago. I got nervous when I ran low. No worries as it is back in stock! Great sauce! This sauce was MOST excellent! I was thrilled that there was NO garlic to RUIN the taste! Wonderful product! 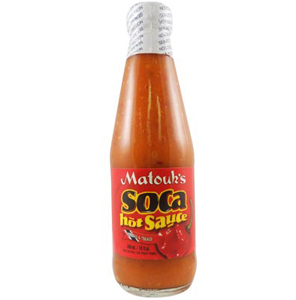 I am a Saint Lucian and always ask friends to bring me this hot sauce back when they go home. This is the real thing! So glad I can get this great hot sauce here. Barron's is the original Saint Lucia hot sauce brand. I have purchased several bottles from this vendor and plan on purchasing several more. It is the only hot sauce that I use. I love the flavor. Mo Hotta, Mo Betta is the best site to purchase this item. I've purchased from them on several occasions with no problems. Great service. I love the hot sauce and the service. Everything came packaged very well, double packed to ensure nothing was damaged. The flavor and the heat are very well matched. This is a great sauce. We already knew we loved this hot sauce discovered on an island vacation. It arrived promptly and was a great gift since it is not available for retail purchase in our area. I was buying some of my husband's favorite hot sauce, Lottie's and decided to see if therew as anything else made like it. Bought this one and he loves it almost as much as the Lottie's, so did everyone else that tried it on Christmas. My wife and I have been enjoying Baron's Hot Sauce for many years now. First enjoying this great flavored taste bud popper in St. Lucia, it has a nice knack of accompanying pretty much anything from a bacon breakfast to Pizza and Steak. We only get this hot sauce from Mo Hotta Mo Betta, and the service provided is exemplary. Two thumbs up! I love this sauce. It gives you a good burn that you can Enjoy!! It's really tasti. I eat some everyday. your price is $2 less than what I buy for. Nice.